Here are 10 people who stood up for peace and human rights. And inspired countless others to do the same. WHEN LOOKING BACK through the mystique of history, we tend to impose super-human status to those who stood up for their beliefs in a revolutionary way. For some of them, the decision to act was conscious defiance to the status quo. For others, they were simply in the right place at the wrong time, and found themselves acting on behalf of others lacking the courage to speak out. We should rightly remember these people. But we should also remember that they were (or are) ordinary human beings, who made a choice. And just like them, the rest of us have the opportunity to choose to engage in creating a better world. In short, we can be revolutionary every day. 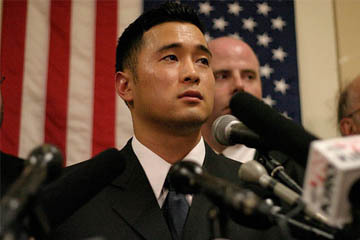 The first commissioned officer of the U.S. armed forces to refuse deployment to Iraq, First Lieutenant Ehren Watada created a furor with his objection and public denunciation of the war in January 2006. Watada entered into the army fully believing the official justifications for the invasion. However, after researching the history of Iraq and the events leading to the American invasion, he concluded that the war was based on false evidence presented to Congress-specifically the existence of the elusive weapons of mass destruction. Watada therefore believed his own involvement would be constituted as crimes against peace under command responsibility. He asked to be deployed to Afghanistan, where he felt there was a true moral imperative to defend the United States, but when the army refused his request or his resignation, Watada did not board the plane with his unit. Military authorities subjected Watada to a court martial in February 2007 and the judge declared a mistrial after deciding Watada’s defense of not following unlawful orders could not be decided in a military court. When a new court martial date was set, Watada’s attorney claimed double jeopardy-his client could not be tried again under the same charges. Today Watada works at Fort Lewis with the continuous threat of a 6-8 year prison term looming over him for the crime of speaking truth to power. Little can be verified about the lone protester who faced-off with the tanks of the People’s Liberation Army on June 5, 1989. 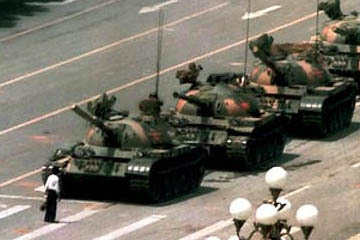 As the column of tanks drove down Chang’an Avenue to quell the Tiananmen Square protests, a single unarmed man in a white shirt blocked their path and continually thwarted their attempts to maneuver around him by stepping in their way. Eventually onlookers pulled the student back into the crowd, where he disappeared. Yet despite his anonymous, brief appearance, the media coverage of his nonviolent act resounded throughout the global community. Stuart Franklin’s famous photo of the stand-off went on to become one of Life’s “100 Photos that Changed the World” and TIME listed the Unknown Rebel as one of the 100 most influential people of the 20th century. Rumors still abound about the protester’s identity and whereabouts. Most believe he was executed shortly after the rebellion and others claim that he lives in hiding in mainland China or Taiwan. Mahatma Gandhi’s Salt March to Dandi in 1930 alerted the world to the burgeoning Indian independence movement. Gandhi’s defiant act was the first campaign against British imperialism since the National Congress’ declaration of independence earlier that same year. A pioneer in mass non-violent protest ever since his expatriation in South Africa as a young man, Gandhi chose to defy the British salt laws by organizing a 248 mile trek to a coastal town to illegally make salt from the sea. By the time he and his thousands of followers reached the sea, word had spread across the country and millions of impoverished and malcontented Indians took up the civil disobedience by disregarding the salt laws. While Gandhi’s march did not directly bring about national independence, it was vital in turning world opinion against British policies in India. For his life-long struggle for freedom, Gandhi is immortalized as the nation’s founding father and remains one of the world’s most beloved figures. 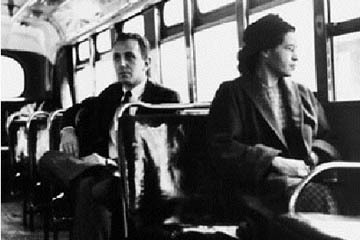 Popularly remembered as the woman who quietly refused to give up her seat for a white passenger on a segregated bus, thereby launching the Civil Rights Movement, Rosa Parks was already steeped in black politics long before her iconic arrest. A secretary of the Montgomery chapter of the NAACP since 1943, she was well aware of the group’s attempts to challenge the Jim Crow laws on public transportation and supported their plans to instigate a bus boycott. Although instrumental to the Civil Rights movement, Parks went on to live in anonymity after the protests, working as a seamstress for almost a decade and not receiving national recognition until later in life. 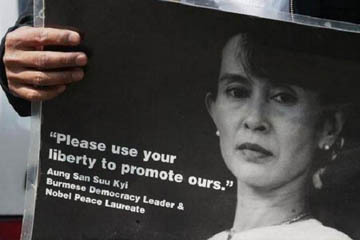 Aung San Suu Kyi remains under house arrest. Aung San Suu Kyi came from a prominent political background-her father helped liberate Burma from British colonial control after WWII and her mother was the fledgling nation’s ambassador to India. Spending most of her younger adult years studying and raising a family abroad, Aung San Suu Kyi always felt that the time might come for her to take up her family’s legacy and fight against the oppressive military dictatorship that had overthrown the civilian government initiated by her father. That moment came when Aung San Suu Kyi returned to Burma in 1988 to care for her ailing mother. Her visit coincided massive public demonstrations against the junta, and she joined the fray. Emerging as the most compelling leader of the popular revolt, Aung San Suu Kyi helped found an opposition political party, the National League of Democracy. In 1990 she was voted in as Prime Minister in the first multi-party elections – a triumph that was nullified by the military government, which had already placed her under house arrest. When the junta offered her release in exchange for permanent exile, Aung San Suu Kyi refused. Instead, the courageous and principled leader continues to live under house arrest, despite the constant peril to her life and the decades-long separation from her family. Aung San Suu Kyi’s tenacious dedication to see a better Burma has led to countless international awards, including the Nobel Peace Prize. Read her essay Freedom From Fear. While most celebrities use the publicity surrounding their weddings as a way to further their careers, John Lennon and Yoko Ono actually took advantage of the media’s voyeurism to stage a protest for peace during their honeymoon. 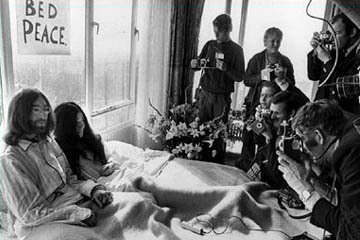 Between March 25-31, 1969, Lennon and Yoko invited the press, expecting to document a more scandalous spectacle, into their hotel room in the Amsterdam Hilton while they sat in bed and spoke of peace. After the success of this inspired stunt, they went to Montreal’s Queen Elizabeth Hotel for another seven-day protest from May 26-June 1. It was here that they first recorded the anti-war anthem “Give Peace a Chance” among luminaries such as Timothy Leary and Allen Ginsberg. Scoffed at by the major media, Lennon and Ono’s demonstration inspired many others throughout the decades to perform bed-ins in passive protest of war. “Give Peace a Chance” remains the emblematic anti-war song of the 1960s. Martin Luther King Jr. addresses the crowd. One of the finest orators and civil rights leaders of the 20th century, Martin Luther King, Jr. did much to change the United States’ policy on racial discrimination. After helping to launch the Civil Rights Movement by heading the 1955 Montgomery Bus Boycott, King founded the Southern Christian Leadership Conference, a black religious organization that directed nonviolent protests against segregationist authorities throughout the 1960s. 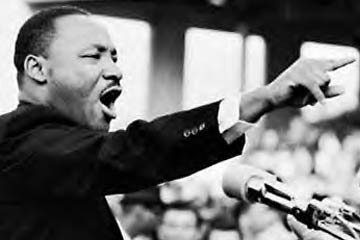 The zenith of Dr. King’s career came on August 28, 1963 with his “I Have A Dream” speech, given at the March on Washington for Jobs and Freedom. Watch the full speech here. Dr. King’s historic speech was a major deciding factor in the passage of the National Voting Act and Civil Rights Act. For his part in advocating racial harmony and equality through nonviolent means, King became the youngest ever recipient of the Nobel Peace Prize in 1964. Although an assassin lamentably cut his momentous career short in 1968, Martin Luther King, Jr. and his words continue to inspire the oppressed everywhere. Ahmad Batebi with the bloody shirt. The subject of a provocative cover of The Economist that created a global backlash against Iranian human rights abuses, Ahmad Batebi’s accidental role in the Iran student protests of 1999 irrevocably altered the course of his life. 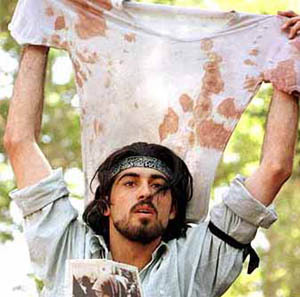 The famous photo shows Batebi waving a bloody shirt-that of a fellow protester shot by plainclothes police-an act many interpreted as a rallying cry of rebellion against the government’s autocratic policies. However, according to a recent interview in the New York Times, Batebi had wandered into the crowd of dissidents, and after using the shirt to staunch the bullet wound of a fallen student, waved the bloodied garment to dissuade others from joining the rabble. Regardless of his intent, the published photo sealed Batebi’s conviction as an agitator. The international recognition of advocacy groups did nothing to mitigate the eight years of unimaginable physical and psychological torture he suffered at the hands of prison guards. However, global attention to his case did save Batebi from the fate that his more unfortunate comrades suffered – an anonymous and brutal death. In 2008, Batebi finally escaped from prison with the help of underground Kurdish revolutionaries and now lives in the United States, where he works for nonviolent political reform in his homeland. An anti-apartheid activist and leader of the African National Congress in his early political career, Nelson Mandela was imprisoned for 27 years for political agitation against the South African government. Yet his struggles only galvanized the cause for racial equality, and he endured to become the nation’s first black president, a Nobel Peace Prize recipient, and an international symbol of freedom. At first committed to passive resistance, Mandela played a major role in the ANC’s many demonstrations and conferences of the 1950s. However, after the Treason Trial of 1956-1961, when 156 dissidents, including Mandela, were arrested, tried, and eventually acquitted, for a communist conspiracy to overthrow the government, the rebellion took a more violent turn. Mandela became head of the ANC’s militia, the Umkhonto we Sizwe. After committing sabotage against several military and government installations, Mandela was arrested and this time found guilty. He spent nearly three decades in prison before mounting international pressure forced his release in 1990, when he made a speech addressed directly to the nation. Watch the video of his release. 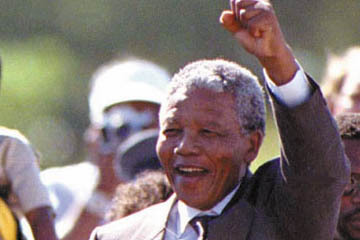 Despite the years of hard labor and harsh conditions he had suffered, Mandela publicly took up the cause of armed struggle again if political negotiations to end apartheid were not initiated. Because of his courage, commitment and leadership, the country went on to hold its first multi-racial elections in 1994 and dismantle racial segregation. Thich Quang Duc burns on the street. The unprecedented media coverage of the Vietnam War brought the brutal realities of human conflict into the world’s living room for the first time, but few images failed to shock more than Thich Quang Duc’s suicide-protest. A devout Mahayana Buddhist monk, Thich Quang Duc spent most of his life in service and teaching, heading monasteries and rebuilding nearly 30 temples. Because of his esteemed position within the community, he was chosen to carry out the infamous mission of martyrdom on behalf of persecuted Vietnamese Buddhists. On June 11, 1963, the 76-year-old monk, seated in a full lotus position in the middle of a central Saigon intersection, publicly denounced the South Vietnamese government’s oppressive policies and called for religious equality. 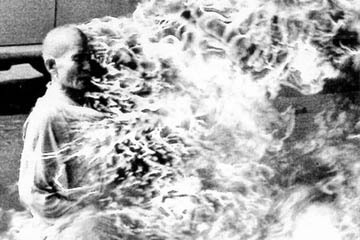 Then, to the horrified onlookers, Thich Quang Duc’s fellow monks poured gasoline over his body and he calmly set himself aflame. While many people still disagree about the tenor of Thich Quang Duc’s suicide, his deed was a decisive turning point in the Buddhist crisis in South Vietnam, which ultimately ushered in a regime change. For his selfless act Thich Quang Duc was deemed a bodhisattva, an enlightened being who delays nirvana to help those in need, and his intact heart became a holy relic. What do you think of this revolutionary courage? Share your thoughts in the comments!